The subject Cardinal Martini develops in this book is that of apostolic consciousness. It is the result of a retreat he preached to seminarians. Following the examples of the Apostles Peter and Paul, every Christian should be aware of being 'sent' by someone else to carry out a work that is not theirs. Christians are not people who roll up their sleeves thinking they have to undertake heaven knows what, organise strategies or believe that everything depends on their ability and efficiency. We are not about pursuing our own pet project. Rather, Christians should experience the excitement of responding to a God who loves them and calls them, and in calling them, sends them into the world, thus having them share in the 'mandate' Christ receives from the Father. In our time, as Pope Francis has also often insisted, especially in Evangelii Gaudium, it is urgent that our faith matures toward a consciousness of mission which is totally connected with that of the Son. In this sense, Martini's book can be said to anticipate Pope Francis' view of the Church. 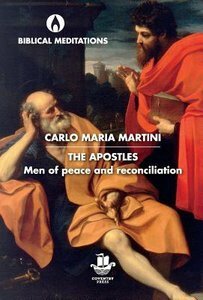 About "Apostles, The: Men of Peace and Reconciliation (Biblical Meditations Series)"